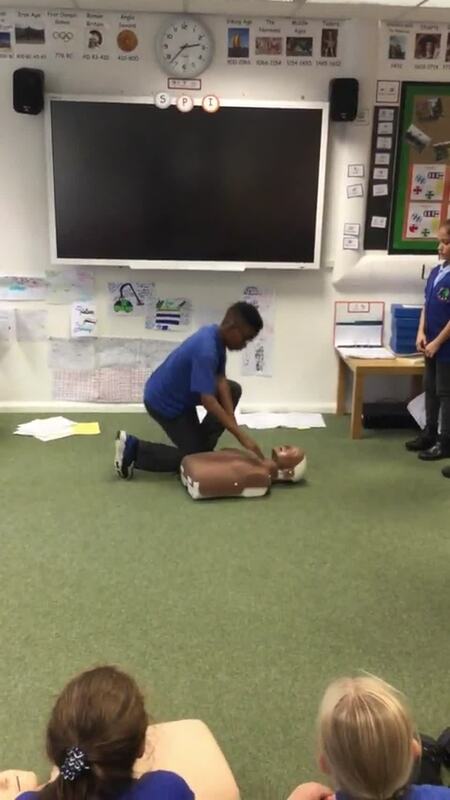 This half term in Skill Force Year 6 are learning some essential First Aid skills. In our first session we learnt how to treat an unconscious casualty using DR SAB. Danger - first we check for danger around the casualty. Response - we check the casualty for a response. Shout - next we shout for help. Airways - we check and open the casualty's airways. Breathing - we look, listen and feel for the casualty breathing. Finally, we place the casualty in the recovery position and wait for help. In our second First Aid session we have learnt how to respond to an unconscious casualty that is not breathing using CPR. 2. Second we give 2 rescue breaths, ensuring that we close the nose and seal the casualty's mouth with our own before blowing in two big breaths. In our third First Aid session we have learnt how to deal with a casualty that is bleeding. Danger - we check around the casualty to ensure that there isn't anything that is going to be a threat to us. Response - we check the casualty for a response by calling out to them and gently shaking their shoulders. Pressure - we ask the casualty to apply pressure to the bleeding wound and elevate if possible whilst we look for some clean fabric or a bandage to use to help stop or slow down the flow of bleeding from the wound. When using a bandage we always leave the short end of the bandage free and wrap the long end around the wound from the roll. You can apply up to three bandages to a wound, if the casualty requires any more then they need to go A&E.